Mark-a-Spot starts with some default content and configuration that takes the developer to a scenario of a public civic issue tracking in New York. You can turn this easily to any crowdsourcing/mapping use-case everywhere. Drupal empowers you to add other features to your website like pages, tag content with keywords or ask users for additional input like name or phone-number. Point your browser to http://markaspot.docksal/user. Login with the credentials of the installation shell output. 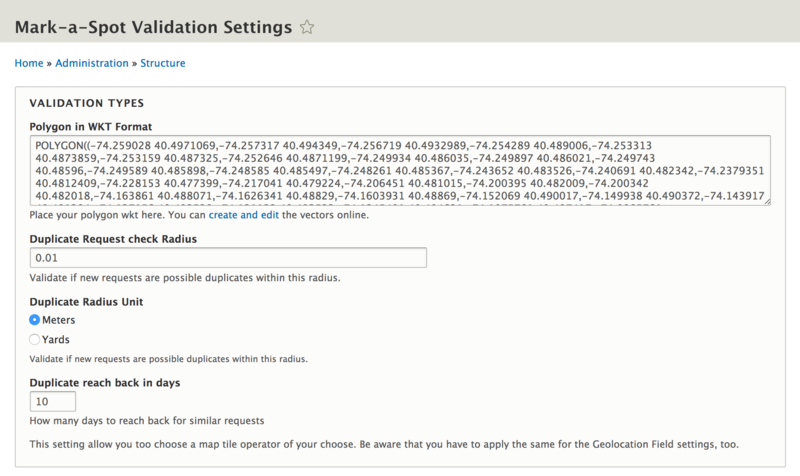 Some settings are Drupal specific, some of Mark-a-Spot's configuration can be reached via it's toolbar. Start with Drupal specific configuration by clicking on Manage. 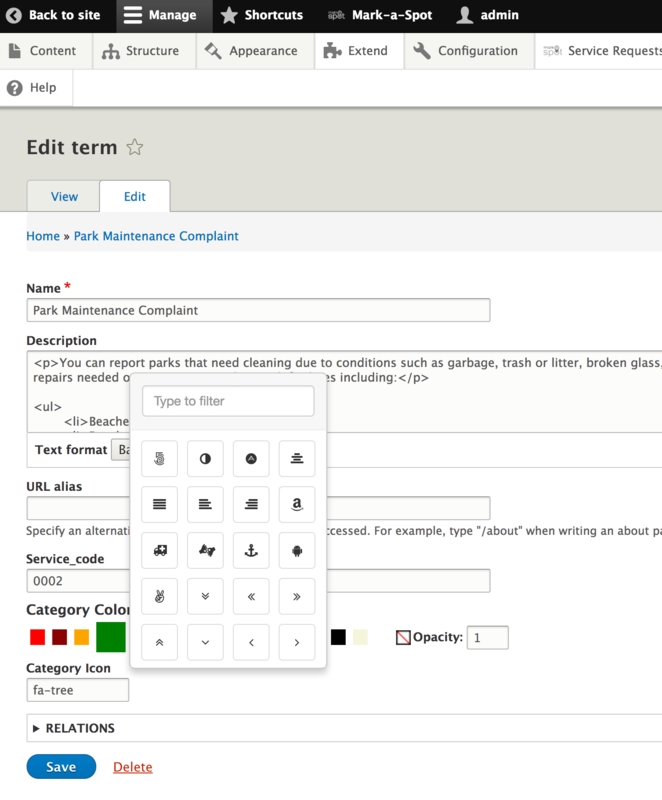 You can now edit the service request content type in order to define all parameters needed to add content to the platform. Mark-a-Spot offers a lightweighted form with a map widget, which needs to be configured. Go to Manage Structure Content types Structure Service Request and click on the Manage form display tab. Check the Location Widget and the settings cog. You should prepare a starting point/adress. Visit your favorite map platform and find a central place within the desired area. 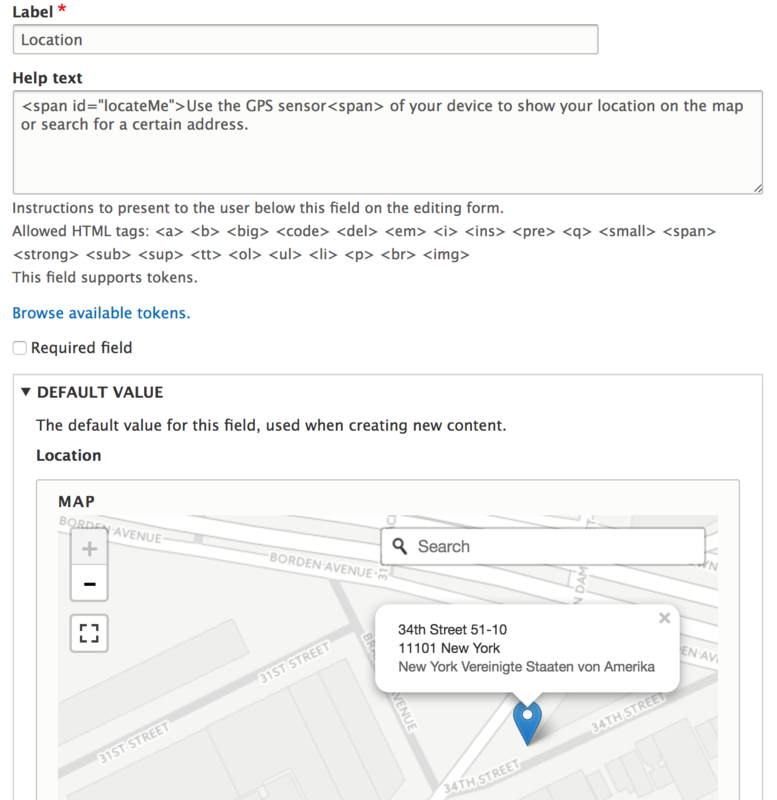 Now edit the location widget: Copy the latitude and longitude value of your desired center and paste the values into the center fields. You may limit the street search results to a specific country or bounding box. Mark-a-Spot validates user input and restricts points to a valid area. This is useful, in case you set up your site for a specific city. Click on the Mark-a-Spot link in the toolbar. Click Mark-a-Spot validation. You will be able to edit the polygon within valid service requests can be placed. Duplicate Posts are prevented by checking for similar points within a specific radius. If you need customization that need to override css or require sass code you can also add a subtheme and define masradix as a base theme. Please check out the documentation at drupal.org for details. Drupal is a content management which helps structuring your information with different features. You already have learned about content types. Those can be referenced by taxonomies which categorize or tag content. Mark-a-Spot uses taxonomies for categories. You can change color, icons and the category name by clicking Structure > Taxonomy > Category Klick List terms Then edit the terms. You can enable and disable the display of the different status by checking the box at Appearance > MasRadix > Settings. Scroll down to the Checkbox. Structure > Taxonomy > Status. This vocabulary was introduced in 8.4 and lets you structure content by jurisdiction or departments. You can specify the #ID pattern of map content (service requests) which will be reflected in the title (category + #id) and the URL of the content created. If you want to migrate content from a different system and not starting counting your content id at 1, you can define an negative offset (-[last id]). If you test with a brand new installation and want to start counting at #1, enter a positive offset. All Drupal typical settings and configuration options will not be aplified here. There a thousands of better sources for that, which will help you. If you need help for commercial support, don't hesitate to contact us. The map visualization is capsulated in a single module which loads all neccessary libraries, like leaflet and waypoint. It also relies on views infinite scroll to be able to scroll down the list of content and have all points shown in the top list. Developers can easily change the behaviour by adopting the map container to the theme. Any other markup created by your view can be used. The connection to the module can be configured.